Not exactly. The Advance model has up to 6 balls, the Pro has 8. You can have them send you up to thst many random balls, but it can be tough if you don't know the topspin or backspin coming at you. The add-on controller I'm building will be better at that though - it will give you unlimited random balls, and will have a display to tell you the spin of the next ball. I'm currently running a local table tennis club on a Saturday morning for 3 hours. One of the players texted me before I went down to ask if I could bring my robot. She's been using a Newgy Robopong which the club owns but the guy who runs the club brings it with him and he wasn't there this week. I brought my Amicus (Advance) down and she spent the full 3 hours playing against the robot. Her and two other players all commented on how "realistic" the robot is when set up properly. She was really impressed with it. I quite genuinely think it's just as good (different, but equal) as playing with a drilling partner - as long as you've got enough room. If you had a coach, and he watched you play competitive matches, and could tell you what drills to do to improve your game... I genuinely think the Amicus could take you to a really good level, unlike other robots which in my opinion aren't realistic (throw angle, spin, etc) and can't facilitate the level of drill you need to get to a certain level in TT. Is the advanced one good enough to have "fun" with (and won't become boring after a while), or should I go for the pro model? I don't know what would be fun for you, but the Advance and Peo are pretty similar. The Pro can have 8 balls per drill, the advance 6. Both are more for practice drills than to simulate real play, but drills with it is a lot of fun to me! If you want something that's more like playing against a human, you'll have to wait for my controller. I'm not sure if this helps, but I've only had it about 3 weeks and have already made ~15 programs (the advanced can only do 10 -- vs the pro than can do 99). I personally think it is more convenient to have a set of everyday drills for warm-up and the rest for "fun". It is very easy to program once you get past the learning curve and therefore I would imagine feeling limited by only 10 program slots and 6 balls per drill. All these drills above I have with underspin variations which doubles to about 12 drills. I know these can easily be modified if you only have 10 program slots, but if you're dealing with many separate ball placements, it can get tedious. 14. backhand - same as "13"
Not having to reprogram it every time I use it is very nice. However, with Dave's controller you could potentially get away with the basic and have everything and more. I just figured to splurge for the Pro since butterfly seems to have pretty good customer service and I'm not sure how long Dave's controller will take to build and iron out the kinks (but it is very exciting if it works out). Pardon my ignorance, but what does "6/8 balls per drill" mean? I was referring to how the advanced and pro versions differ by their maximum number of different balls delivered per drill. 6 balls versus 8 balls per drill (each ball with potentially different spin, speed and placement). It doesn't seem like a big difference, but the real hook for me was the higher limit of 99 saved exercises versus 10. With all the extra room for drills I think it makes the experience much more "fun"
FWIW, we have an "owners" thread here: http://ooakforum.com./viewtopic.php?f=67&t=27118 . That isn't to say that any recent posts belong there or anything… I just wanted to point it out in case some hadn't seen it or posted in it yet. As ironic as it is given their model names, I suppose the Professional is therefore better suited to players who use the robot for fun. If you're using the robot to improve your game or warm up before competitive play, 10 drills is perfectly adequate. I use 6 drills. If I had more space, I could add 3 or 4 more but unfortunately I don't have room to chop on my backhand side. Random levels of backspin and float -> read the spin! I can't remember exactly how I set this one up but it's a mix of long topspin, backspin and float balls to loop at about 55bpm. Can the robot head be located not at the centre of the table? For example off to the left or to the right? 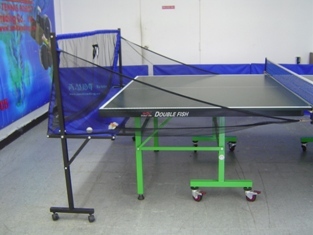 One limitation may be that the deflectors may not be able to project balls across the entire width of the table if the head/motor is not centered. For example, if it is placed on the "left side" of the table, it may not be able to project balls to the extreme "right side"
Last edited by tt-jim on 08 Mar 2015, 10:57, edited 1 time in total. Interesting point. Can the direction of the head be rotated so that it angles towards the opposite side? Can the head be detached from the collection tray and simply moved freely along the table? I presume that the head is clamped onto the table.... and that perhaps the collection tray hangs off the head, which means that moving the head would equally move the collection tray...? Now that I think about it, the head can rotate. So if you place the head/motor on one side, you can probably change the angle inwards so the range of the balls from the deflector plate could span the entire table. I think its possible. (if any other owners think otherwise, please feel free to jump in). Edit: It seems that the net/tray (velcro) can be entirely removed, but I haven't physically tried. if you search in the owners thread, there are pictures of my amicus that may better explain. It's a lot of screws, but yes - you can detach the head/collection tray from the net/frame. I have done this. And you can rotate the head too.